We build amazing decks at Evergreen Landscape & Design. Our approach is to blend deck design with landscape design. A deck company who just builds decks will try to sell decks and nothing else. We use a combination approach, constructing decks and incorporating stone patios, which provides a more balanced approach and breaks up the overly expansive, multi level deck design. 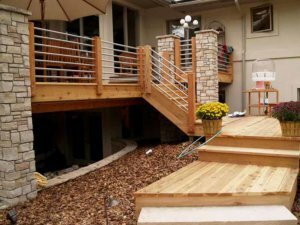 We have been designing and building decks in Evergreen Colorado and the surrounding communities of Conifer, Golden, Genesee and Morrison for 15 years. We understand all the elements of the deck design process and complete everything from the design, county approval and permitting to installation. Deck installation starts with a great deck design. Evergreen Landscape & Design listens to the desires of the customer and completes a deck design to fit their lifestyle and desired use of space. We can design decks with outdoor kitchens, outdoor fire places, with composite materials or even stone decking. The best deck designer will take into account both the use of the deck space and the space below; the landscaping. By their nature, decks are off the ground and often have stairs down to another level. If those stairs go to a ground level, then that’s the point at which we blend landscaping with deck work. We strive to incorporate both the deck’s design with the landscape design, creating a seamless flow from deck to landscape. The goal is to tie together, both, deck and landscaping, creating balance and flow from woodwork to stonework. All of the decks we have built in Evergreen, Colorado, are designed to balance with our mountain landscape, taking special consideration of the existing landscape, our customers’ needs, desires, and budget. Please call us to schedule a free consultation for your deck work in Evergreen, Colorado, and the surrounding communities of Conifer, Golden, Morrison and the entire Denver metro area.